Travel to Central Asia, where the doors to history, civilization, and the warmest welcome in the world are our pleasure to open for you. This is our homeland, and every visitor is an honored guest. Central Asia rewards the intrepid and the curious, its routes dotted with UNESCO World Heritage Sites, and its magnificent landscapes unfold like a fabled Turkmen carpet. The local experts at Silk Road Treasure Tours know the perfect sites, the hidden gems, the right people, and the best times to go. And we'll get you there in comfort with the best of guides and a bespoke itinerary. Steep yourself in 3,000 years of culture and traditions in hand-picked accommodation, whether in a vibrant capital city, behind sun-warmed adobe walls, in a village nestled in a lush valley or a nomadic yurt under a sky of blazing stars. Explore palaces, medresseh, fortresses, and caravanserais from by-gone eras amidst classic Soviet architecture, soaring minarets, glittering blue cupolas, lace-like ornamentation and brilliant ceramics on medieval mausoleums and mosques. Visit the bustling bazaars - still as busy now as they were hundreds of years ago, where anything is available and everything is on display. Clamber over the ruins of ancient Parthian fortresses or sleep in the desert next to a giant glowing crater. Ride horseback around a stunning alpine lake, or lumber on a Bactrian camel over rolling dunes. Feel the pulse of civilization where history and cultures merge. Enjoy the heady Silk Road cuisine redolent of spices from far away and as tempting as fresh bread from the clay tandur oven. The nations of Uzbekistan, Kazakhstan, Kyrgyzstan, and Turkmenistan are the ultimate destinations for those seeking the trip of a lifetime. Travelers here find a world that stands between times, a land of contrast and extremes. 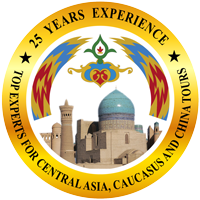 Silk Road Treasure Tours offers signature experiences filled with adventure, opportunity and a tradition of hospitality unmatched anywhere in the world. Ashgabad is an oasis town, set on the edge of the desert in the foothills of the Kopet Dagh Mountains. After complete devastation in an earthquake in 1948, it was rebuilt – Soviet style, with wide, straight avenues and monumental architecture. Nissa is on the agenda today - the ancient capital of the Parthians. An archaeologist's dream, with ruins of 3rd century BC fortresses, citadels, temples and tombs. Back in Ashgabad, the National Museum here has impressive displays of archaeological finds from sites excavated in the oasis and an informative and attractive display of fabulous Turkmen carpets, costumes and domestic items. The Tolkuchka Sunday bazaar - one of the largest and most amazing open-air bazaars in the world is not to be missed! If you can think it, you will find it there. 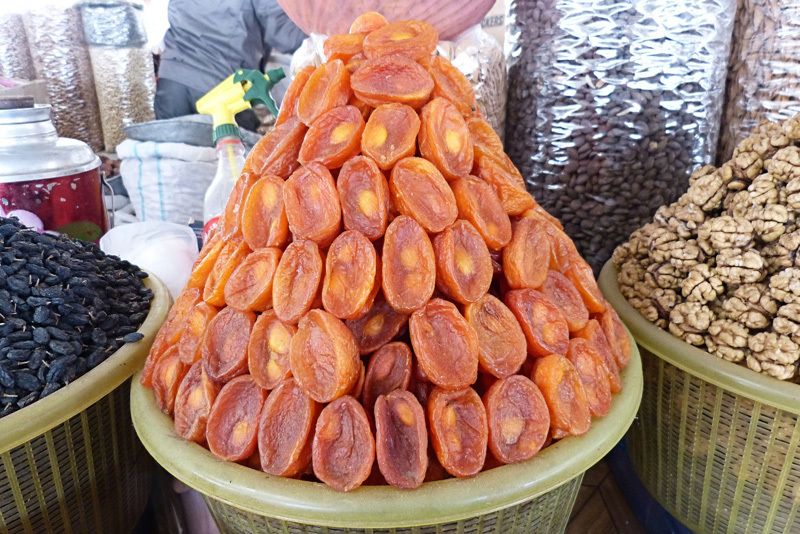 From bread and produce, to clothing and electronics, handicrafts and hair brushes, car parts and camels! It's the carpets here that attract the eye, endless displays of tribal reds, oranges, geometrics and contrasting ivory patterns, but few can resist the urge to try on the huge, furry telpek hats of the region! A visit with the director of a horse breeding center brings the importance of equestrian culture here into focus. Overnight in Ashgabad at the Sofitel Hotel in the heart of the city. 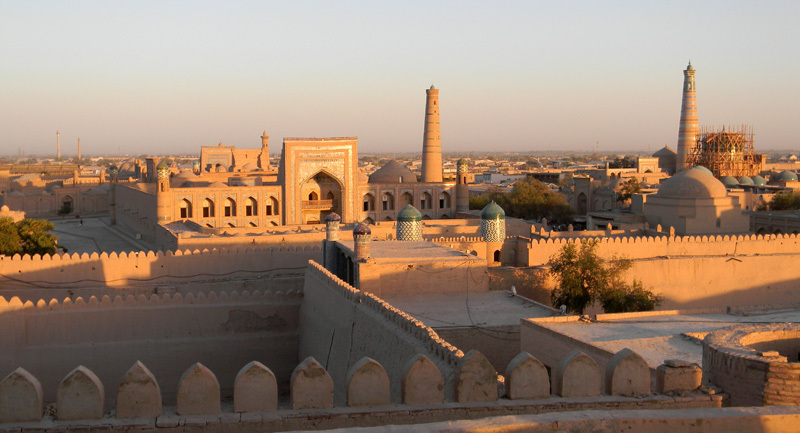 Fly from Ashgabad to Dashogouz, Uzbekistan today, and on to the ancient, walled oasis city of Khiva, one of the most popular UNESCO World Heritage Sites of the Silk Road. We will stop at the ancient ruins of Kunya Urgench. This ancient archaeological treasure still remains an important pilgrimage site. Dinner will include a performance by a local folklore group. 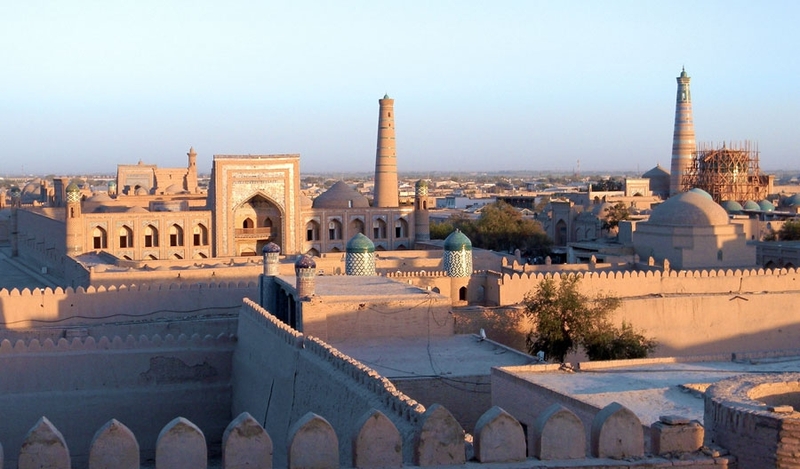 Evening in Khiva is magical with the city's minarets silhouetted against the starlit sky. 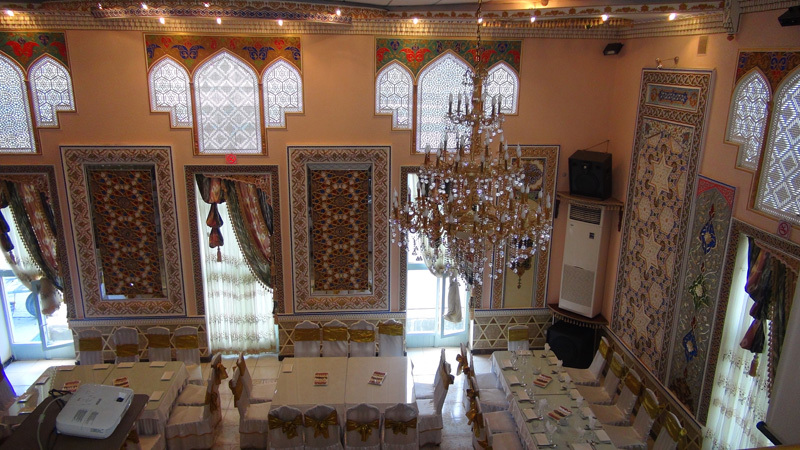 Accommodations here at the Asia Khiva hotel located in the heart of the historical town center. Khiva is a "living museum" This fairy-tale city has some of the best preserved historical architecture in the Old City including the Ichan Kala: the Ata–Darvaza gates, the majestic, blue-tiled Kalta Minar tower, the Mohammad Aminkhan and Khodja Islam medressehs, the Kunya Ark (Ancient Citadel), Tash Hauli Palace (with view of the palace's harem-quarter), Caravanserai (traditional inn for travelling merchants), and the astonishing Juma mosque with its 200 beautifully carved wooden pillars. The afternoon's flight will get you to Tashkent to see the evening lights of the capital city of Uzbekistan. Accommodation will be at one of the premier hotels here; the Tashkent Palace or the Hyatt Regency Hotel. Tashkent is a vibrant, modern showcase city, it glitters in the sunlight and glows at night. Completely rebuilt after the 1966 earthquake, it boasts wide boulevards, classic Soviet architecture and fabulous green and public spaces. Mustakillik Square (Independence Square) is the place for national events and celebrations. The Tashkent metro stations are individual works of art, and the Alisher Navoi Opera and Ballet Theatre is decorated to reflect the different regional styles of the country. This morning we will visit the landmarks of the city; The Khasret Imam, Sheik Tellya Mosque, and the Chor-Su Bazaar to watch craftsmen at work, enjoy the bustle of the market and bargain for souvenirs. We'll compare the old with the new at Mustakillik Square and the imposing bronze of Tamerlane himself at Emir Temur Park. Top museums here include The Museum of Applied and Decorative Arts, The State Museum of the History of Uzbekistan, and the Fine Arts Museum which boasts one of the best collections of paintings in the former USSR. Board the First Class coaches on the high speed rail to legendary Samarkand, a city with more than 3000 years of history. One of history's greatest romantic legends is that Alexander the Great married the beautiful Sogdian princess Roxana here. Arrival and accommodation for two nights at the Registan Plaza Hotel, offering old world charm, warm hospitality, and modern comforts. On our discovery of ancient Samarkand we will be joined by an historian for a richer understanding of the importance of this fabled city. Registan Square in Samarkand is one of the most recognized landmarks of the ancient world. Surrounded on three sides by the majestic porticoes of its medressehs it's the site of world-class music festivals and national celebrations for Navruz, the Persian New Year in March when it seems that the whole country breaks out in celebration. We'll begin a full day of "monumental" exploration here, including stops in the gloriously gilded Tilla Kari. Within the old city are the remains of the 15th century observatory of the astronomer Ulug Bek, and the tomb of the Hebrew Prophet Daniel in the old Jewish quarter. The Shah I Zinda Ensemble is the ancient necropolis, a veritable museum of tile artistry under the open sky. A series of 11 mausoleums line a medieval street, offering a first-hand, up-close lesson in Islamic decoration, near the hills of ancient Afrosiab. Nearby the Bibi Khanum mosque was built by the ruler Tamerlane to honor his favorite wife and the scale is considerable, meant originally to outshine all of the mosques of the East. The splendid decoration of the Gur I Emir mausoleum, built for Tamerlane and his descendents competes with the best of the architectural gems of this city; glazed, gilded, and painted, incorporating tracery, marble, onyx, and semi-precious stones. Situated along the route from China to the west, Samarkand was not only the capital of Tamerlane's empire, it was a center of trade – for goods, culture and intellect. 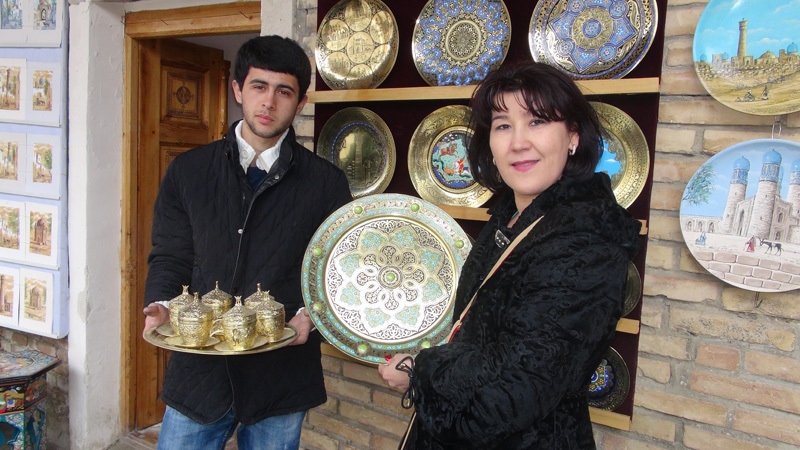 A visit to one of the oldest wineries of Uzbekistan will fortify us for an exploration of Samarkand's handicraft center. A folklore show in the square will follow dinner at the Registan Restaurant. The rest of the afternoon is yours to enjoy in this desert oasis and our guides will be happy to help you plan your adventure! We can recommend that you follow tradition here and relax on a divan, sip your green tea and enjoy the social life at one of the many chaikhanas in the city. Under the shady mulberry trees which surround the reflecting pool at the Lyabi Khaus complex, the traditional heart of the city, tea and gossip reign, artisans sell their handicrafts and at night the colored lights give a festive air to the local dance troupe. The Uzbek tea ceremony is a formal and graceful ritual, poured three times from the pot into a ceramic cup allowing the full flavor and aroma of the tea to develop. While green tea is the standard, there is a wide variety of black and herbal varieties. Try the chai kymoki ; green tea with milk and butter sprinkled with almonds. Tonight we'll enjoy dinner with a folklore show at the Nadir Divan Begi Khanaka. Originally designed as a caravanserai in the 1600's it was then hastily converted to a medresseh to cover for an Imam's mistake! The show tonight features local dancers and singers and a fashion show displaying gorgeous costumes handcrafted by Uzbek designers well-known for incorporating the country's rich fabrics and intricate designs. We'll be the guests for two nights at one of Bukhara's most charming boutique hotels - Sasha & Son, with its location just steps from the center of town. Bukhara, once the intellectual center of the Islamic world can trace its origins to the 6th century BCE. 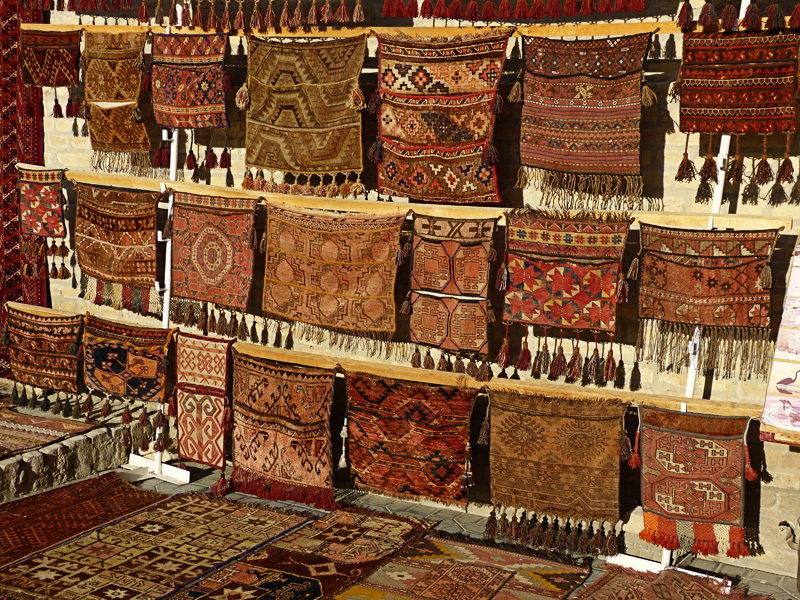 One of Central Asia's holiest of cities, behind the ancient adobe walls, the backstreets are lined with spice markets, artisan and carpet shops, and the homes of families who have lived here for generations. Beside the Lyabi Khaus pool is the largest Koranic school in Central Asia, the medieval Kulkeldash Medresseh. The Kalyan Minaret, part of the Poi-Kalyon complex dates back to 1127, a fitting symbol of old Bukhara. When Genghis Khan invaded he left only the minaret standing, legend says that he was struck by its beauty. The city's subdued desert hues lend centuries-old buildings their own exotic air in Uzbekistan's holy city. The Fortress Ark defended its rulers and their servants over the centuries while some sixty caravanserais could be found within the city for traders and travelers. 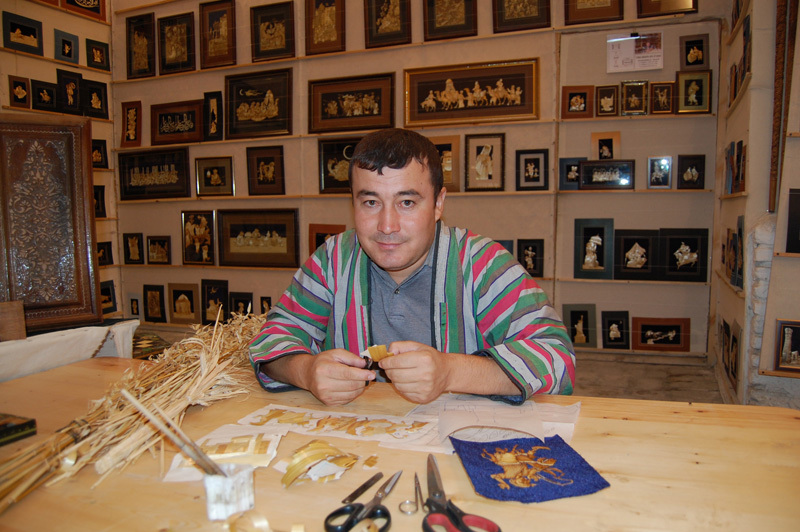 Try on traditional outfits at the national costume exhibit in the former merchant's house of Fayzullo Khokjaev. Wind your way through the city's ancient trade domes of the money changers, hat, and puppet sellers, as well as carpet, jewelry and embroidery merchants. Stop at a local designer's shop and try on gorgeous embroidered coats and ikat patterned jackets. We'll visit the Magoki Attari, originally a Zoroastrian temple and the oldest surviving mosque in Central Asia which now hosts a carpet museum displaying examples of the distinctive colors and patterns of the region, the Abdulazizkhan Medresseh with its sandali (the original home space heater), the winter residence of the local rulers from the 1st century. After seeing the four, blue-domed minarets of the unique Chor Minor complex, we'll finish at the Sitorai Mohi-Khossa or Palace of Moon and Stars. This magnificent summer residence of the last Bukharan Emir reflects a fusion of both Oriental and Russian architecture and design and the harem building now houses a Museum of Applied Arts with displays of suzani - traditional regional embroidery. 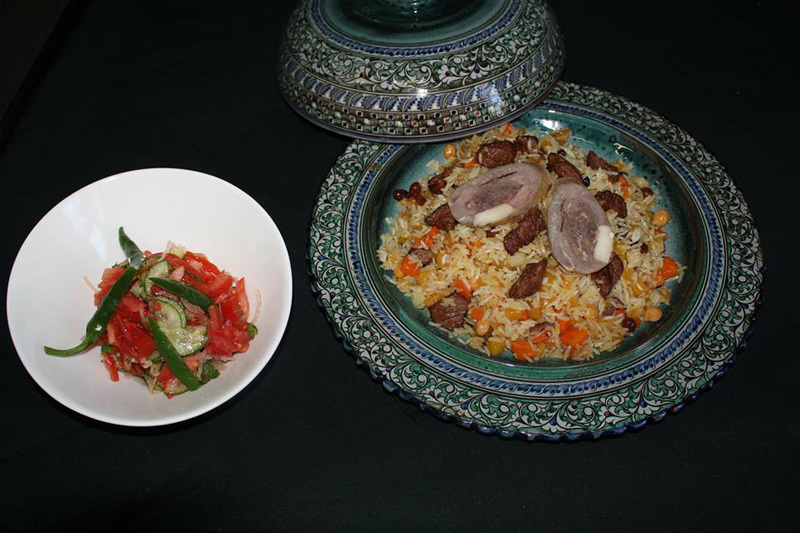 For lunch we will be the guests of a local Uzbek family and experience the famous hospitality of the region! After dinner tonight we will take a flight back to Tashkent to start our journey to Kyrgyzstan the next day. Bishkek is the capital of Kyrgyzstan; the "Hidden Switzerland" in the heart of Central Asia. Set against a backdrop of the Tien Shan Mountains, this city is an intriguing mix of Soviet style and European influences. Watch the changing of the guards at Ala-too Square, relax in the shade of Oak Park, and even see one of the last (if not the biggest) statues of Lenin left in the region. Learn more about the fascinating modern history of Kyrgyzstan with the help of an American university professor here. This region has long been of cultural and historic significance, a key stop along the Silk Road to China. Today we will head out to Lake Issyk Kul. Along the way is the Burana Tower complex with the remains of an old minaret near Tokmok city. Constructed in the ancient town of Balasagun, one of the capitals of the Karakhanid State, this area is a treasure trove of archaeological gems, with an expanse of ruins of the great city and a small museum nearby. Here we can see a collection of balbals – ancient carved Turkic headstones which often appear like oversized game pieces sitting about in the grass. Kyrgyzstan is a tapestry of unspoiled nature and breathtaking vistas. Lake Issyk Kul, with its blue waters and red sand beaches is a popular summer destination. A saline lake; it is surrounded by the rugged beauty of the Ala-Tau mountains with opportunities for trekking in the surrounding foothills and relaxing in thermal springs. It is an environmentally significant habitat especially for migratory birds. Relax at the water's edge and tour around the lake at this delightful spot. We will visit the picturesque gorges of Cholpon-Ata, with its stone garden of petroglyphs and prehistoric monuments. Archaeological evidence shows human habitation here over 2500 years ago. Hunters, deer, snow leopards, sun symbols, and chariots all figure on these ancient remains, echoes of which feature on regional carpet and handicraft designs. Parts of Kyrgyzstan will make you think that time has stood still here for centuries, with spectacular scenery of lush pastureland dotted with horses and the occasional shepherd, isolated yurts or small villages, and a dizzying sense of freedom. Horses are a way of life in Central Asia and the sturdy, sure-footed Kyrgyz horse is a prized possession for those who follow the nomadic life in the high-altitude jailoo pastures here. There are a myriad of activities here, including horseback riding, jam making with local fruit and herbs, setting up a yurt, or watching demonstrations of Kyrgyz traditions. The wedding Kyz Kuumai has the bride, assisted by her sister-on-law, given the best horse to try and outrun the groom. He must try to catch up with her to prove his love, although most weddings are not cancelled should he fail! We will return to Bishkek to take our flight to Almaty, Kazakhstan. Almaty, is the historical capital of Kazakhstan and derives its name from the Kazakh word for apple. Legend has it that this ubiquitous fruit originated right here. We will transfer from the airport in Almaty and settle in to the luxurious Ritz Carlton hotel for our final two evenings. Opposite the presidential palace in Republic Square we are ideally located to explore this exciting city; its parks and gardens and alpine vistas. Ala-tau Park in the foothills of the Tien Shan Mountains is located just 15 km from the city and provides spectacular panoramas over this lovely area. We will enjoy this view from the hills after visiting the Green Bazaar, the Museum of Kazakh Musical Instruments, the Tsarist-era Cathedral of the Holy Ascension and the Golden Warrior statue at Independence Monument. We'll be entertained by local musicians at our farewell dinner and have the opportunity to try our hand at some of the popular music! Check out and transfer to the airport for your flight home. We'll say good-bye, and hope that we see you again soon in Central Asia! Explore UNESCO World Heritage sites and treasures of antiquity that have inspired historians and scholars through the ages. Tour magnificent temples, medressehs, mosques, and medieval caravansarai of bygone eras, with their graceful arched portals, elaborately carved latticework and glittering tile façades. Get behind the scenes with the experts on private, curated visits to museums, galleries, and historical sites. Visit a fashion atelier, see the up and coming work of young designers, and have a one-of-a kind piece made from gorgeous local fabrics. Premium seating is yours for performances of traditional music and dance. Be delighted by the flash and swirl of regional dancers and the haunting melodies of the flute, frame drums, and two and three stringed lutes. 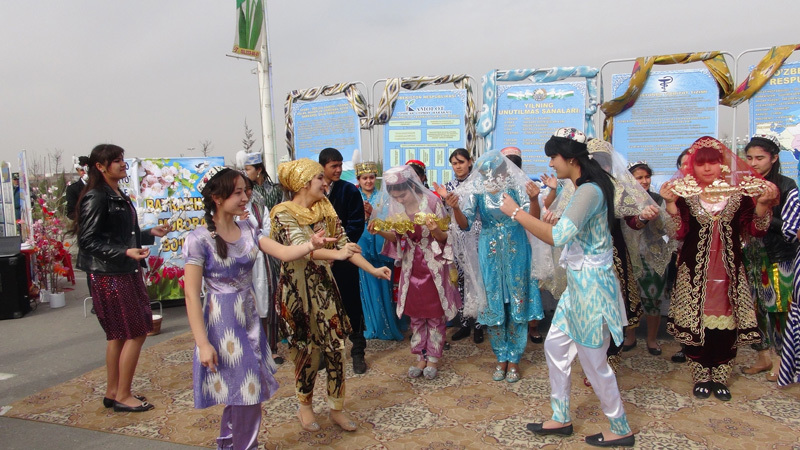 Festivals and celebrations are exuberant displays found throughout the year in Central Asia. Central Asia is a photographer's paradise, offering inspiring vistas, unique subjects, and amazing light and color. Our guides will make sure that you find the best angles!